Bon Appetit is synonymous with good food! Located in a gorgeous Georgian Townhouse in the popular costal village of Malahide, just north of Dublin City Centre with close proximity to Dublin Airport; Bon Appetit offers a unique dining experience.Bon Appetit is a contemporary restaurant serving the very best of Modern Irish and European Cuisine. Bon Appetit is perfect for a quick bite after work; a weekend get-together with family and friends, a relaxed leisurely afternoon or a romantic meal for two. Bon Appetit consists of a contemporary and stylish restaurant located on the lower ground floor serving Brunch, Lunch, Afternoon Tea and Dinner or our Wine and Tapas Bar, located on the ground floor. Bon Appetit also offers two Private Dining Rooms, located on the first floor of the building, which are available for Weddings, Family, Private and Corporate Parties for up to 65 guests. Our Private Rooms are perfect for private dining, family events, birthday celebrations, communions, confirmations, christenings, weddings and meetings. Vouchers must be printed and presented in paper form upon arrival at Bon Appetit on the night. Vouchers are valid Sunday to Friday until Friday 26th of August. The redemption date of 26th of August is firm. No correspondence will be entered into regarding late redemption of your Rewarding Times Voucher. Vouchers are valid for dinner bookings only from 6pm. 3 course dinner for two includes choice of starters, mains, dessert plus a Champagne Cocktail each on arrival at Bon Appetit. This offer is not valid in conjunction with any other offer or promotion at Bon Appetit. Please be advised the menu provided is sample and subject to change. 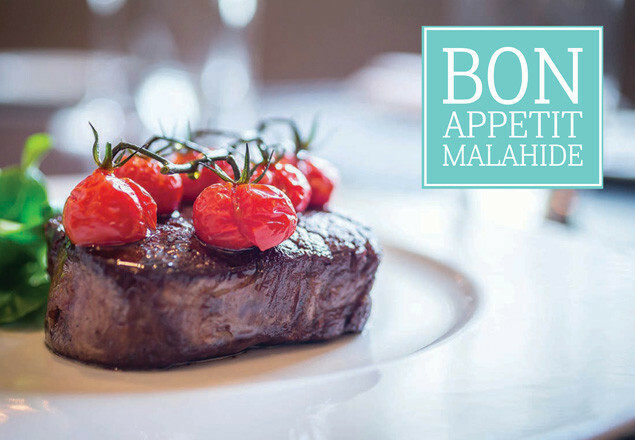 A supplement of €8.00 applies to the Rib Eye of Beef. Any over spend of this offer will be paid directly to Bon Appetit on the date of the reservation.